If you need to make screenshots of the installation it is useful to influence their size. You could press F3 in the boot menu and choose from a menu, but that is not well suited for scripts such as openQA. The installer now obeys an option from the boot command line: xvideo. You can now install from a repository served with HTTPS that has a self-signed certificate. Use a ssl_certs=0 boot option. Last sprint (S#20) we improved the registration UI. 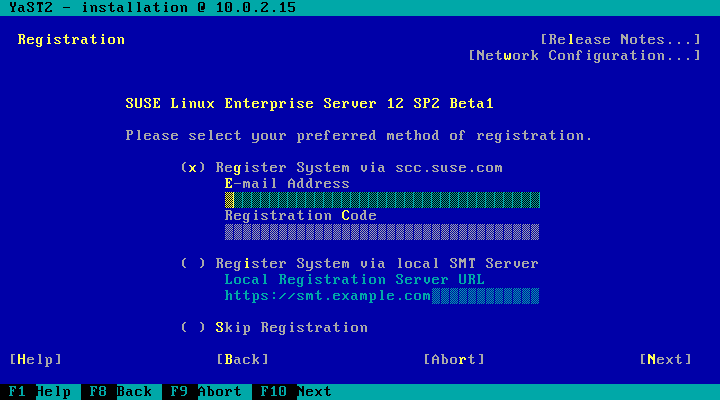 Now we’ve made one more improvement: pre-filling the Register System via local SMT Server field. Before, the widget was a single text field and a little helpful smt.example.com was always shown (no matter what your actual domain was). We have started building an installation ISO image with the new storage library. The first build contains all the pieces but they don’t work together yet. 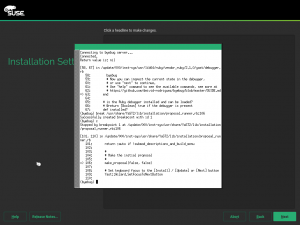 We have documented the supported scenarios regarding booting in the new storage layer. If you opened Network Settings to review something, made no changes, and closed the dialog with OK, the network would be restarted. That may be undesirable if you have an Important Application running. We originally thought that everyone would close the dialog with Cancel, but we were proven wrong. Now the module properly checks whether you have made changes to the settings, and omits the restart if appropriate. 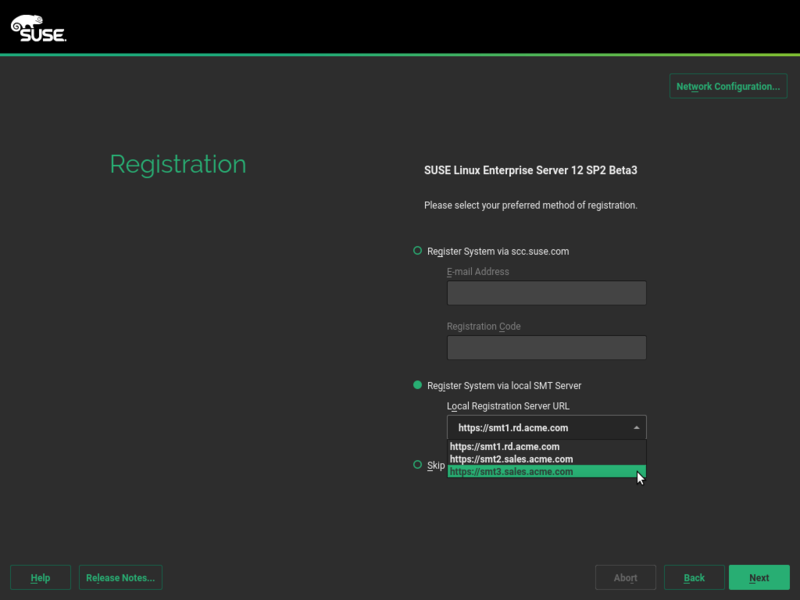 Due to a problem in the AutoYaST version shipped with SLE 12 SP1 and openSUSE Leap 42.1, the network configuration used during the first stage was always copied to the installed system regardless the value of keep_install_network. 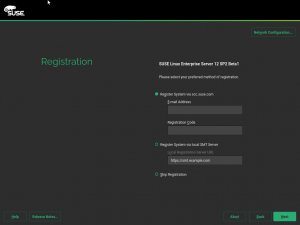 Upcoming SLE 12 SP2 and Leap 42.2 behaves as expected and keep_install_network will be set to true by default. The latest Scrum sprint of the YaST team was shorter than the average three weeks and also a little bit “under-powered” with more people on vacation or sick leave than usual. The bright side of shorter sprints is that you don’t have to wait three full weeks to get an update on the status. Here you have it! Until now debugging the YaST installation was usually done by checking the logs. If you needed more details you would add more log calls. This is inconvenient and takes too much time but, as every Ruby developer know, there is a better way. Being a fully interpreted and highly introspective language, Ruby offers the possibility of simply intercept the execution of the program and open a interpreter in which is not only possible to inspect the status of the execution, but to take full control of it. From now on, you can access those unbeatable debugging capabilities during the installation. All you have to do is boot the installer with Y2DEBUGGER=1. For more details see the brand new documentation. You can also see several examples and screenshots of the debugger running in text mode, through the network and in other scenarios in the description of the corresponding pull request. Most software enthusiasts and developers, specially free software lovers, will know the mantra “release early, release often“. The earlier you allow your users and contributors to put their eyes and hands on your software, the better feedback you will get in return. 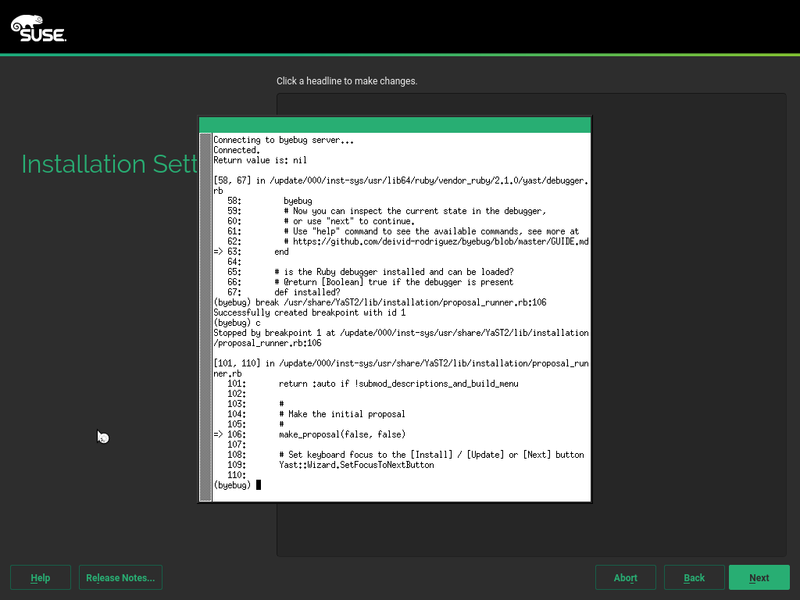 And that proved to be true one more time with YaST and the awesome openSUSE community. In the previous post we introduced a new functionality being added to YaST2 – more explicit and interactive importing of SSH host keys. Some users quickly spotted some usability problems, right in time for the fixes to be planned for this sprint. In the description of this pull request you can see several screenshots of the new interface in several situations, with the new main dialog looking like this. Iterative development rocks when you have involved users. Keep the constructive criticism! The user interface was not the only aspect of SSH host keys importing that got improved. For every feature we add to the interactive installer, we always take care of making it accessible from AutoYaST as well. Thus, an AutoYaST profile file can now contain a section like this to control the behavior of the new functionality. Another success story about collaboration in the YaST world. In the report about sprint 18 we mentioned we had received some contributions in order to add Firewalld support to YaST2-Firewall and that we were collaborating with the authors of those patches to get the whole thing merged in Tumbleweed. After a couple of sprints allocating some time to keep that ball rolling, we can happily announce that YaST2-Firewall in Tumbleweed already supports the “classic” SUSEFirewall2 backend and the brand new Firewalld one! 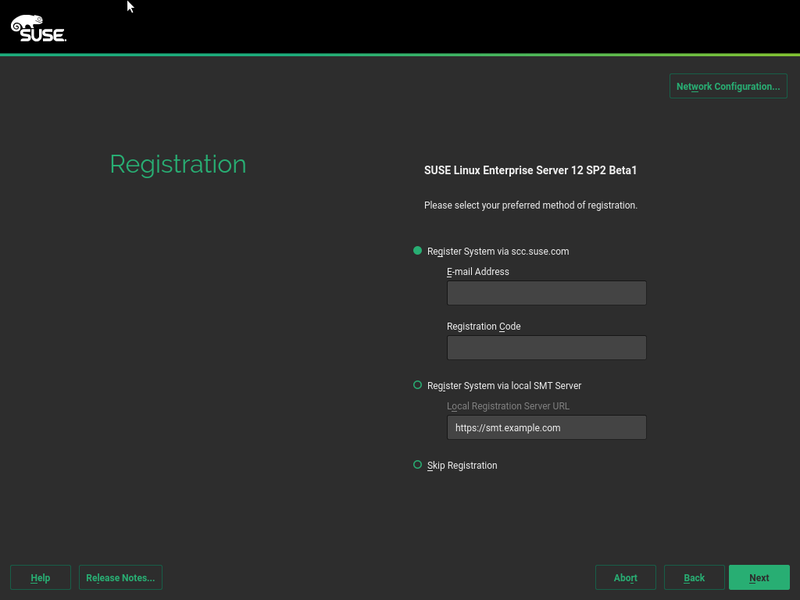 SUSE’s VNC guru Michal Srb has been working lately in improving the ability to share and reconnect to VNC sessions. Until now, YaST always created a new separate VNC session for every client and closed the session when the client disconnected. There was no simple way to share the session with additional clients or to keep it running after disconnecting. Now, thanks to Michal, the remote module can be set up in three different VNC modes: disabled, xinetd and vncmanager. Check the definition of each mode in the description of the pull request. Six sprints ago, the “Local User” screen got some love and the UI was greatly improved. 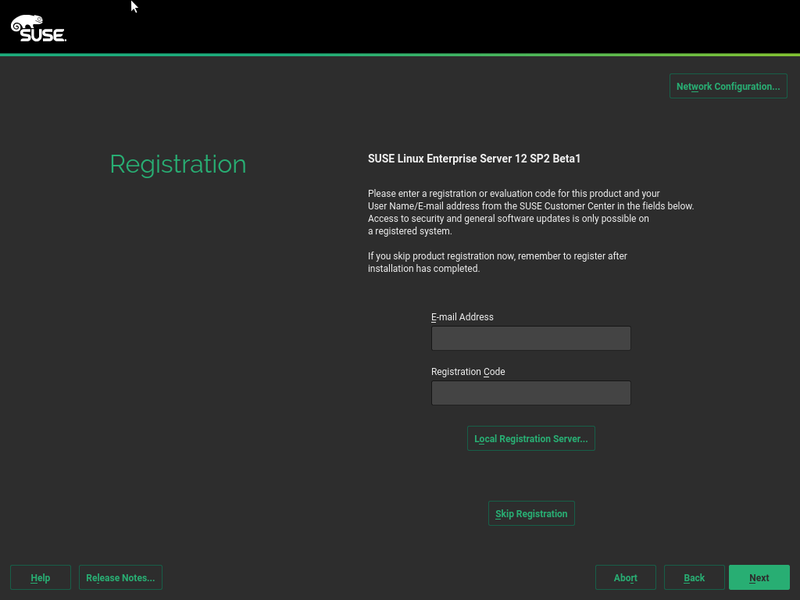 During this sprint, and according to bug #974626, we have improved the registration UI to make it consistent with the “Local User” screen. Register the system using scc.suse.com by introducing an e-mail and a registration code. 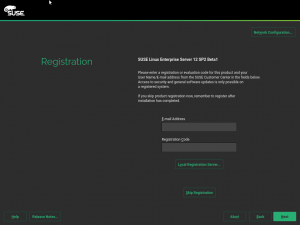 Register the system using a local SMT server (no e-mail or registration code are used). Options 1 and 2 are mutually exclusive but, if you look at the interface, that fact is not clear. Moreover, we wanted this dialog to be consistent with the new “Local User” one. The new dialog looks like this, with the three mutually exclusive options being directly presented to the user. As always, redesigning a UI in YaST implies making sure it works nicely in the NCurses interface with screens with a resolution of 80 columns and 25 lines of text. Doesn’t it look nice (provided the reader has a geeky aesthetic sense)? As usual, progress goes steady in the rewrite of the storage layer. In this sprint we invested some time into the partitioning proposal, which is now able to propose a good layout in some very complex scenarios with highly fragmented disks with limited partition schemas. In addition, preliminary support for LVM was added although is still far from being complete and full-featured. We always finish our reports saying something like “this was just a sample of all the work done, stay tuned for another report in three weeks”. But the weeks ahead will be a little bit unusual. This week a SUSE internal workshop is taking place. That means that many YaST developers are focusing on stuff different from their daily duty. In addition, openSUSE Conference’16 and Hackweek 14 are both round the corner. As a result of all those “distractions”, next sprint will be shorter than usual (just one week) and will not start immediately. Expect next report at some point close to the start of openSUSE Conference. By the way… see you there!